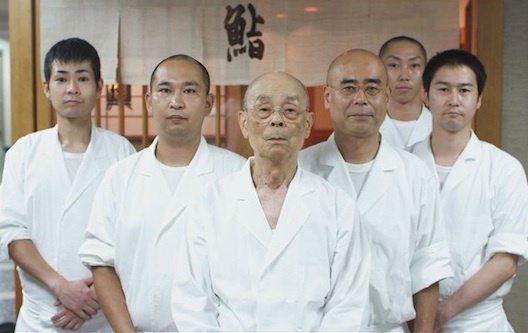 Fourth Row Center: Film Writings by Jason Bailey: In Theaters: "Jiro Dreams of Sushi"
“You have to fall in love with your work,” Jiro Ono says. “You must dedicate your life to mastering your skill. That is the key to happiness.” Jiro says this early on in David Geib’s charming documentary Jiro Dreams of Sushi; he looks straight into the camera, firm in this belief, but with a faint smile hinted on his lips. He looks, in that moment, like a man who has figured it out, and after spending an hour and a half with him, we’re pretty sure he has. Jiro’s is the finest sushi restaurant in Tokyo, recipient of multiple awards and reams of praise. It seats ten people. Reservations must be made at least a month in advance. They serve no appetizers; their menu consists of exactly one item—the “chef’s recommended special course”—priced at $30,000 yen (just shy of $400). No one complains about the lead-time, the limited choices, or the cost, because the sushi is incredible. And that’s because Jiro has dedicated his life to it. “I would make sushi in my dreams,” he says. “I would jump out of bed at night with ideas.” He worked back-breaking hours as he learned his craft (Of his 5am-10pm work days, he candidly admits, “I wasn’t much of a father”), and at 85, he is still striving, still working (“If I stopped working at 85, I would be bored out of my mind”), and still obsessed. “I’ve never seen a chef be so hard on himself,” says Masuhiro Yamamoto, the food critic who is his biggest fan. The only difference between Jiro now and forty years ago, Yamamoto says, is that he no longer smokes. Geib’s documentary is a modest affair; he spends some time with Jiro and his two sons, both of them trained by the master. One left the restaurant (at Jiro’s insistence) to open his own restaurant, while the other remains, and will take over for his father “when the inevitable occurs.” As a filmmaker, Geib is fascinated by the logistics of the operation—the types of sushi, their pros and cons, the vendors who bring them, the atmosphere and rituals of the fish market. And he exhibits a loving, borderline-fetishistic attention to detail; the preparation of the sushi is seen in tight, loving close-ups (the cinematography, also by Geib, is dazzling), sometimes in lingering slow-motion, accompanied by lushly-orchestrated, romantic music. But his primary interest is in Jiro, who is undeniably absorbing—serious-minded but with a dry wit, displaying a real warmth in his engaged, unguarded moments. He is proud of his life’s work; when Yamamoto brings a group to eat at the restaurant, Jiro and his son talk with them after the meal, and he’s is like a magician explaining his tricks (or, more accurately, a magician having them explained, by the verbose Yamamoto). The critic, in a lengthy (and nicely visualized) description, characterizes Jiro’s sushi dinner as a concerto with specific movements, or even as an illustration (and dramatization) of a specific philosophy. The straightforward manner in which the subject presents these little mantras and incantations keeps Jiro Dreams of Sushi from lapsing into a filmed self-help guide, though it could certainly serve that purpose; it gave this viewer a sense of shared purpose, a longing to do one’s work with the same devotion and dedication that Jiro gives to his. That’s a sublime feeling to get from a little documentary about a sushi chef, even if he is one who proclaims, “While I’m making the sushi, I feel victorious. That’s how it makes me feel.” We all have that thing, yes? Something that gives us that feeling, or something that would? And that, friend, is how it’s a film about much more than sushi. "Jiro Dreams of Sushi" is out tomorrow in limited release.